Despite the best hiking tour that River Explorers organized for us, this 2 days rafting trip for us was the perfect ending to our travel. Excellent in every sense, food, guides, gear…..Thanks River Explorers!!! 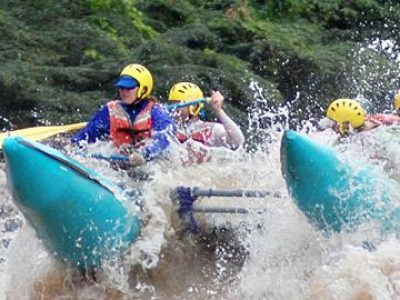 Rafting the Urubamba River during the rainy season is one of the best day tour for rafting in Cusco. Beautiful scenery with green valleys, snow-capped mountains, Inca ruins and great rapids adorn this adventure from beginning to end. Time per day in the river: 2 to 5 hours approx. Season: All year, but we recommend going mid-December to April, best time for most rafting day trips from Cusco. 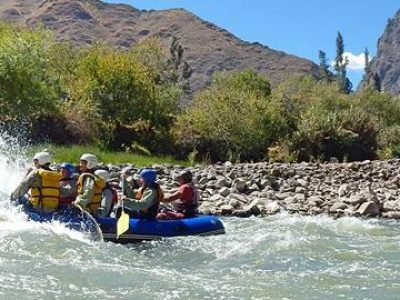 There are many other day trips from Cusco departing to different sections of the Urubamba river, with no doubt during raining season the rafting on this section is the best in Cusco and Peru. At 8 am, passengers will be collected from their hotels. We drive for about 1 hour and 45 minutes until we arrive to a beautiful Andean town called Checacupe, which will be the beginning of our trip. Before the tour begins, we will give you a safety briefing about commands and safety instructions. This practice will be followed by practicing on the river. The first hour on the river is calm, with nice rapids at level II ideal to practice the commands and safety instructions. After a good lunch, the river becomes a little more aggressive, with constant class III and III­+ rapids, until we arrive at our first camp. Meals Included: 1 lunch, 1 dinner. Rafting in Cusco is becoming very popular, but there are not to many people who knows that during raining season is the best. For most of our clients, today’s adventure features the best rafting on the Urubamba river. After a nourishing and energizing breakfast, we will start running the river for one hour with class III and III+ rapids. Eventually, we arrive at the middle of the canyon called Chuiquicahuana, which is considered the most difficult and exciting section on the trip. 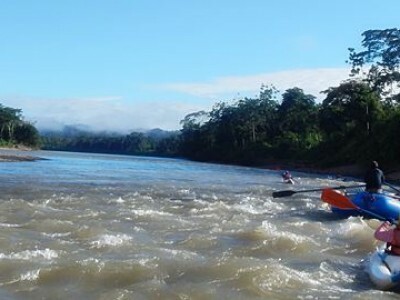 More than 8 km – 4 miles of pure adrenaline with rapids such as Siphon, The Knife, Butterfly, Hawaii are one of the various rapids that we will encounter along the way. The River then calms for about 25 minutes and next is about to come the last part of the section, Quiquijana canyon with mostly standing waves good to try our one person inflatable kayaks. After these exciting rapids, we will arrive at the end of the rafting where we will have a nice lunch waiting for us. Travel time to Cusco 1 hour and 30 minutes. Meals Included: 1 breakfast-1 lunch. *Notes that this section can be one of the most dangerous to run. If river conditions are too risky, we will choose another section to prevent accidents and minimize risks. This decision is 100% up to the rafting guides. Camping gear: Passenger and dinner tent, camping tables etc. Warm clothes for the evening (long trousers, fleece,) shorts, t-shirts, bathing suit, sandals., personal items, sun block, insect repellent, sleeping bag (for rent 15 U$) and sleeping pad (for rent 15 U$). For tours in the Urubamba river during rain season, you need to be careful which company to choose. Rafting tour operators need to know and choose the best rafting section for your safety. Below are some tips to make better your rafting experience in Cusco. Flexible departures, pick a day and we start from there we guarante the departures with a minimum of 2 people. 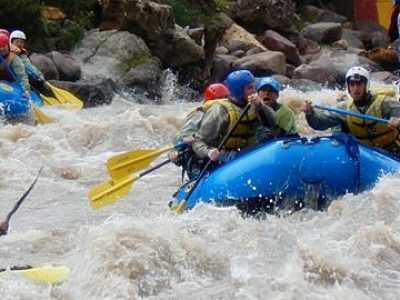 There are 2 main season for rafting in Cusco area, the rain and dry season. Dry season: From April to December. Raining season: Normally is summer in the Peru during this time, because the Andes and the Jungle it rains from mid – December to April.